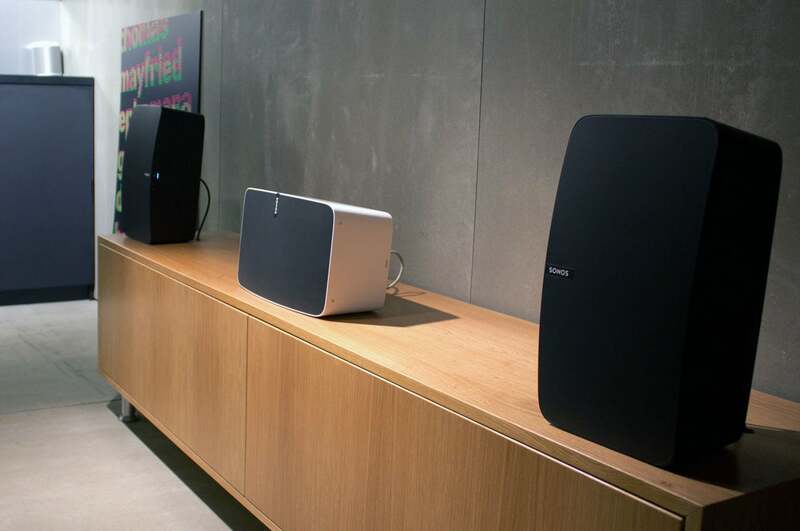 Trueplay software can customize Sonos speakers to play the best they possibly can in the rooms they’re in. I couldn’t talk about one of the most exciting products I saw at IFA while I was in Berlin. 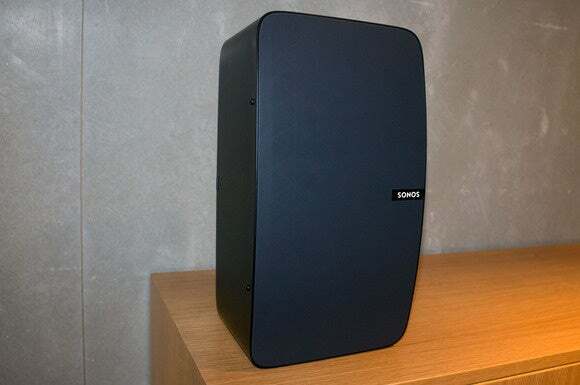 Sonos had a booth at the show, but you needed an invitation to a secret booth—essentially a studio apartment that Sonos hid in a staging area between exhibit halls—where the company demonstrated its new flagship powered speaker and some impressive new software called Trueplay. I’ll cover Trueplay first, for two reasons: First, it’s a free upgrade that will be available to anyone who owns a Sonos component (although it will only work with the Play:1, Play:3, and Play:5 speakers at launch). Second, the demo in Berlin blew my mind. When you launch Trueplay on an iPhone, iPad, or iPod touch (and it must be an iOS device, for reasons I’ll explain later) the speaker will emit a series of tones as you walk around the room, raising and lowering the device, bringing it close to and further away from the walls. The process requires the room to be relatively quiet, but it takes only about three minutes for each speaker, and you don’t need to repeat it unless you move the speaker or significantly rearrange your furniture. Using the processor on the device and a DSP in the speaker, Trueplay will determine the location of the speaker within the room, analyze the room’s acoustic properties, and completely transform the speaker’s performance. Sonos’ least-expensive speaker, the Play:1, was used for the demo, and it was placed on a countertop and shoved all the way into a corner—a worst-case scenario for speaker placement. 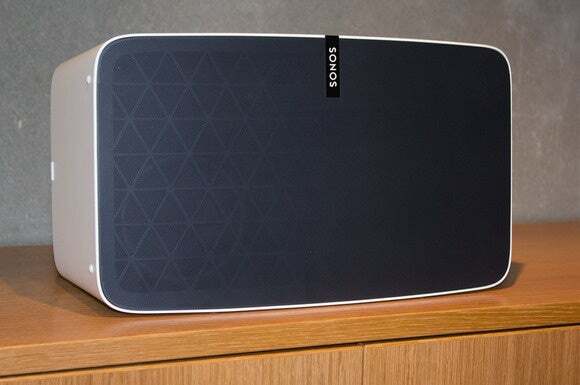 But after Sonos’s Senior Product Marketing Manager Kevin Kaul used Trueplay to re-tune the Play:1, the speaker delivered an exceptional performance. Note the side-firing tweeters on the new Sonos Play:5. Sonos is being coy about how Trueplay works, but Kaul did tell me that the software works with a DSP that’s in all Sonos speakers. The system analyzes how the test tones the speaker generates reflects off the walls, furnishings, glass, and other surfaces in the room and adjusts the speaker’s audio signal accordingly. If you don’t like the results, you can make further EQ adjustments manually. So why is the software limited to iOS devices? As Kaul explained, “it must be an iOS device because the mic needs to be consistent. We can rely on the mic on an iOS device to be of a certain type and at an expected location. You don’t get that with Android devices. There are many different mics used [on Android devices] and they’re in many different places.” Sonos isn’t ruling out Android support in the future, but you’ll need an iOS device to use Trueplay for now. Oh, and for the security conscious: At no point is the data about your room uploaded to the cloud. The Trueplay demo was performed with the Sonos Play:1 on the counter, pushed far into the corner. 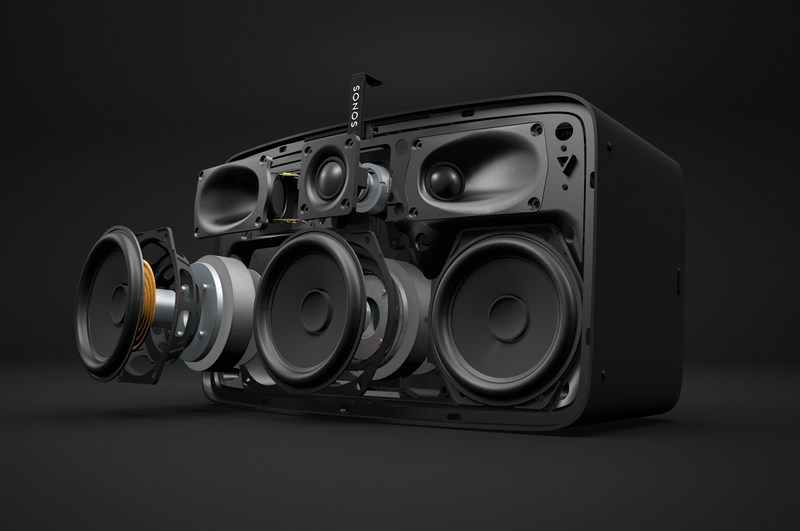 Sonos has for completely redesigned its flagship powered speaker, the Play:5. Kaul said everything about the new Play:5 is different. The new model is outfitted with six drivers: Three tweeters and three mid-woofers (the original Play:5 had two tweeters, two mid-ranges drivers, and a woofer). The speaker can operate either vertically or horizontally, and its orientation makes a big difference: A single speaker will produce a stereo sound stage when positioned horizontally. Stand it upright, and an onboard accelerometer detects the change and transforms the Play:5 into a monophonic speaker that can be paired with a second Play:5 to form a stereo pair. When configured alongside a Sonos PlayBar and Sonos Sub, a pair of Play:5s can even become the surround-sound speakers in a home-theater configuration. There will be no buttons on future Sonos speakers. They're being replaced by this touch-sensitive badge. A pair of microphones inside the Play:5 are dormant for now, but they might be used in the future to measure the acoustic properties of the room the speaker is operating in. Sonos didn’t provide a full spec sheet with dimensions, but Kaul did tell me the new speaker was almost 50-percent heavier than the original. There wasn’t an old-school Play:5 in the room for me to compare it to, but it certainly looked a whole lot beefier than the original as I remember it. The Play:5 becomes a mono speaker when oriented vertically. Two together will operate in stereo this way. This is a paper launch, so we’ll have to wait a bit longer to get our hands on the new speaker and software to see how it performs in the real world (the press release says both products will be available “later this year”). The speaker will be available in a matte black and matte white finishes and will retail for $499. Trueplay, as I mentioned earlier, will be a free upgrade. Each time Sonos introduces a new product, I take the opportunity to ask when, if ever, they’ll add support for high-resolution audio. I usually get a non-committal answer. Not this time. “At this point we don’t see the need to do 24-bit audio,” Kaul said. “Lossless is perfectly good for the world today. 24-bit audio takes too much bandwidth.” Yeah, he left some wiggle room by qualifying his answer with “at this point…,” but I don’t think we’ll ever see it happen.